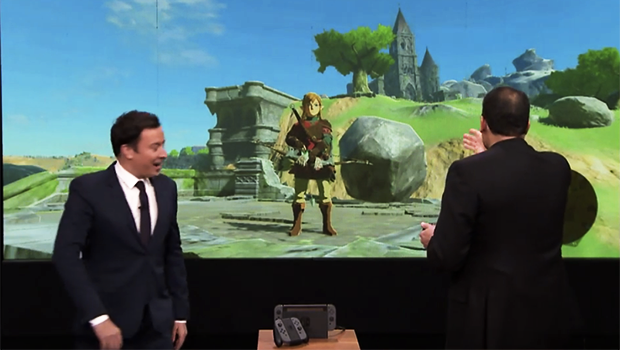 Jimmy Fallon surprised audiences tonight when, for the first time on television, he showed The Legend of Zelda: Breath of the Wild being played on the Nintendo Switch. The Tonight Show segment begins with the President of Nintendo of America, Reggie Fils-Aimé, showing Fallon how to play Nintendo’s upcoming mobile game, Super Mario Run. He soon introduces Fallon to a surprise guest, Breath of the Wild creator Shigeru Miyamoto. At the five minute mark of the video below, Fils-Aimé reveals the Nintendo Switch, plays a few minutes of the upcoming Zelda title, and shows the Switch’s ability to instantly change from a console unit into a portable gaming device. Jimmy Fallon is predictably excited by the Switch, but he has good reason to be. While there have been previous playable demos of Breath of the Wild, all of these have been the Wii U version of the title. The Tonight Show also represents the first time that Nintendo has publicly shown their hybrid system in action, even if it was a very controlled environment. The Nintendo Switch will be available March of 2017, though Breath of the Wild will not be a launch title. Super Mario Run will be available for purchase on smartphones on December 15th for $9.99.